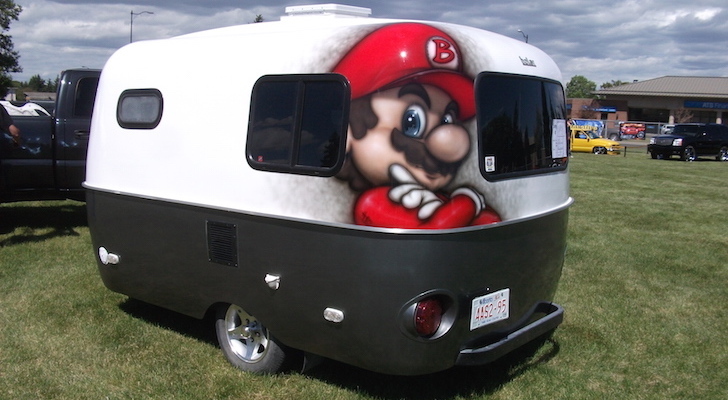 From dish tubs to kayaks, there are many handy items out there that collapse down for easier RV camping. 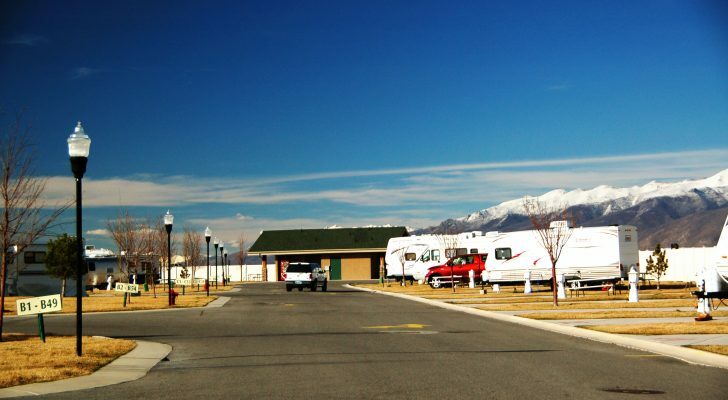 No matter what size RV you own, saving space is always important. 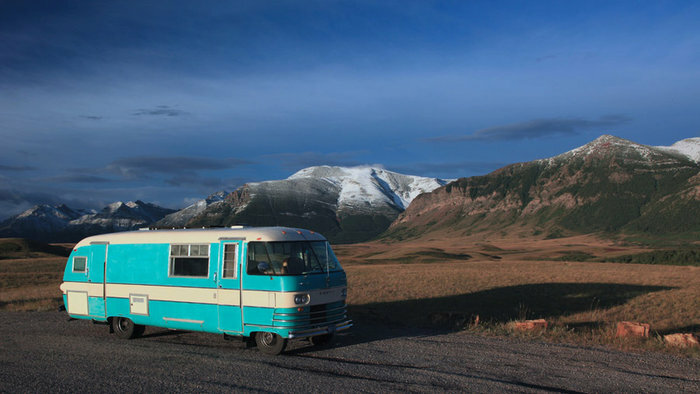 Nobody likes a cluttered cabinet or countertop, so snagging a couple of space-saving items can make camp life a lot more simple. Granted, camping stores and manufacturers already have collapsible chairs, tables, and even some collapsible campers. 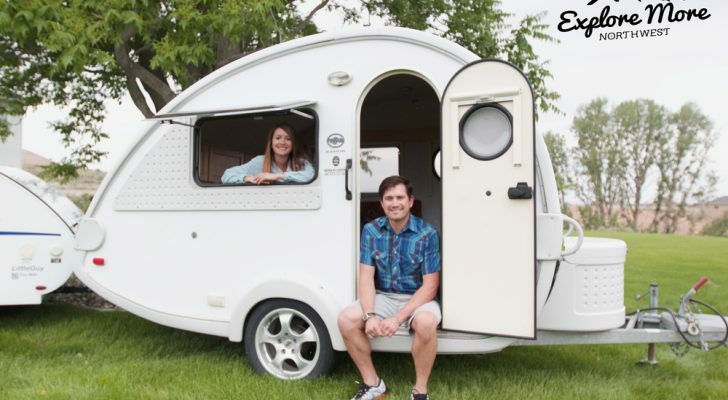 However, these 12 everyday items are affordable and easily purchased online and add a little color to your RV life. How about waking up to this bright and shiny tea kettle? This beautiful design boils up to five cups of water and collapses when not in use. It works on both electric and gas stoves and is dishwasher safe. Colanders are another indispensable kitchen item that tends to get in the way. 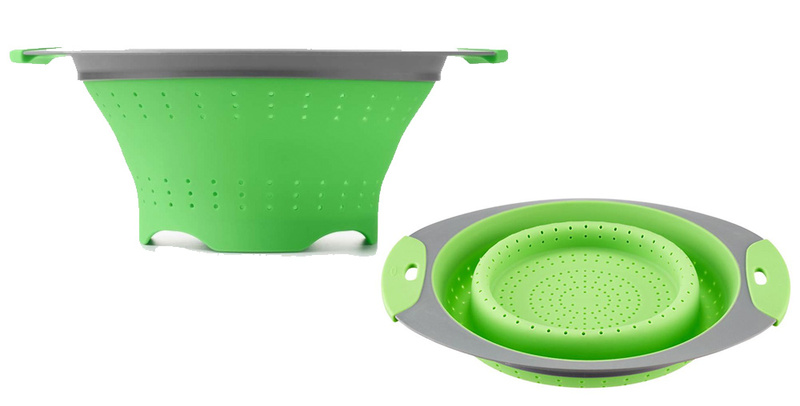 This colorful and collapsible one from OXO Good Grips not only saves space, but it is easier to clean than metal colanders. It packs away flat when not in use. Salad and mixing bowls are useful, but only once in a while. 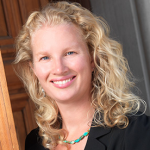 When you are not utilizing them, they need to stay out of the way. 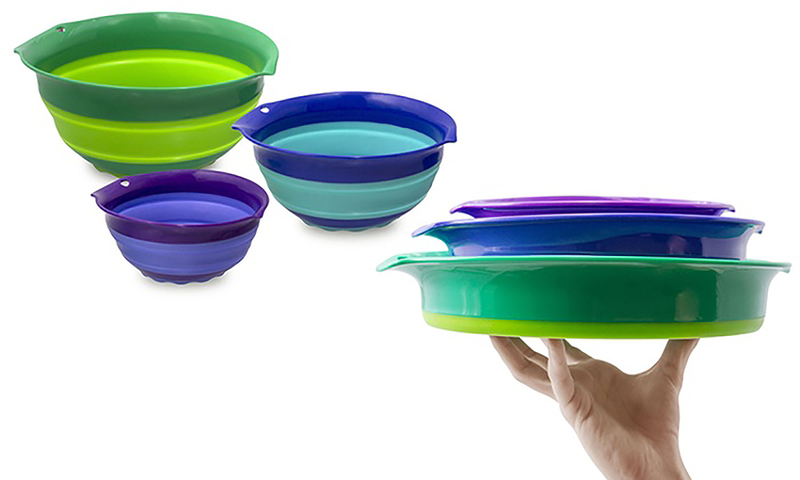 The Squish collection of silicone bowls come in a 1.5-quart size, 3-quart size, and a 5-quart size. They each have comfortable handles and store inside each other. 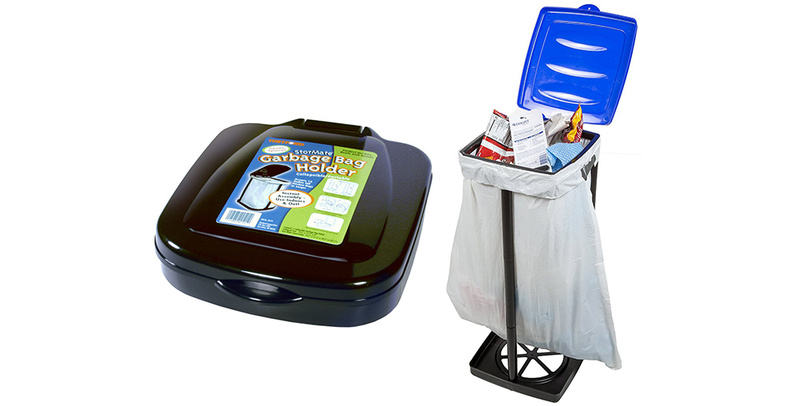 This tidy, collapsible trash can from StorMate folds up into a 14×11 size square that only takes up two inches of width space. The holder can be used both inside and outside and holds a 13 gallon or larger kitchen trash bag. What’s also nice about this design is that there is no plastic container that needs to be cleaned out. Dish tubs take up a surprising amount of space. While they are handy for holding or transporting other items, emptying them to do dishes or small items of clothing can get tedious. This 2 1/3 gallon Prepworks dish tub can be used indoors and outdoors and is rigid enough to hold water, beverages, or even to wash a small pet. When collapsed it only takes up two inches of space. 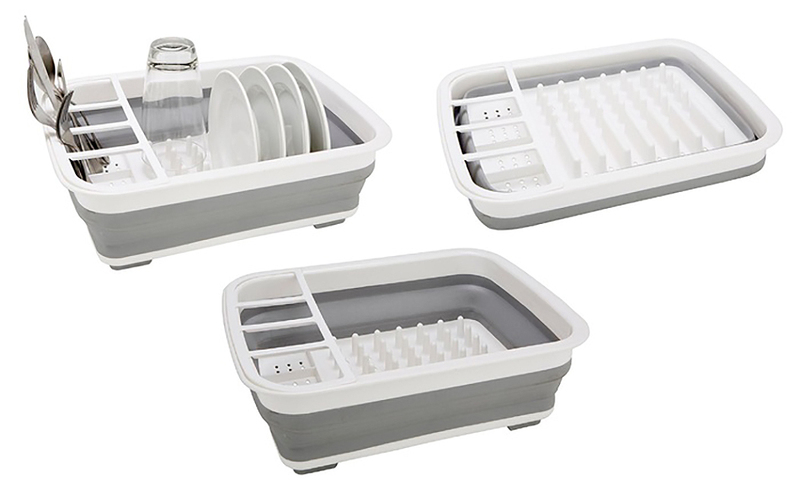 Along with the dish tub, make sure to pick up the matching Prepworks dish rack. 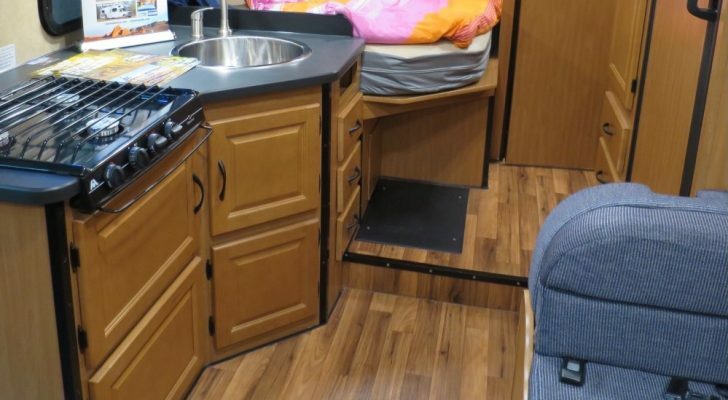 Dish racks take up valuable RV counter space, but this Prepworks rack collapses down to only 2.5 inches. It holds around a dozen dishes and has a separate silverware holder. The dish rack also comes with a handy snap-on drain board that can be angled to drain out water. 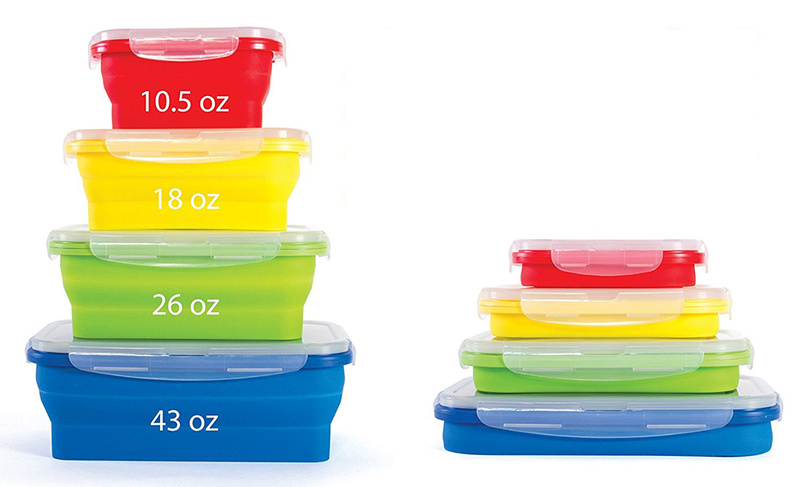 While typical food storage containers can stack inside each other, they are even better when they collapse down. This set of four containers from Kitchen + Home collapse down to 1/3 of their size and stack inside or on top of each other. 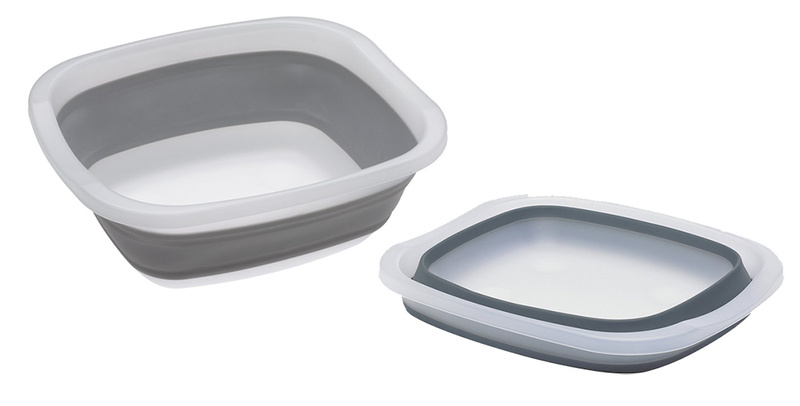 They each come with airtight lids with air vents for microwave heating. They are made of food grade silicone and easy to clean. Popular with tent campers and backpackers, the lightweight Luci is a collapsible solar-powered light that is easily opened by pumping or blowing air into it. When compressed the light takes up less than an inch of space. 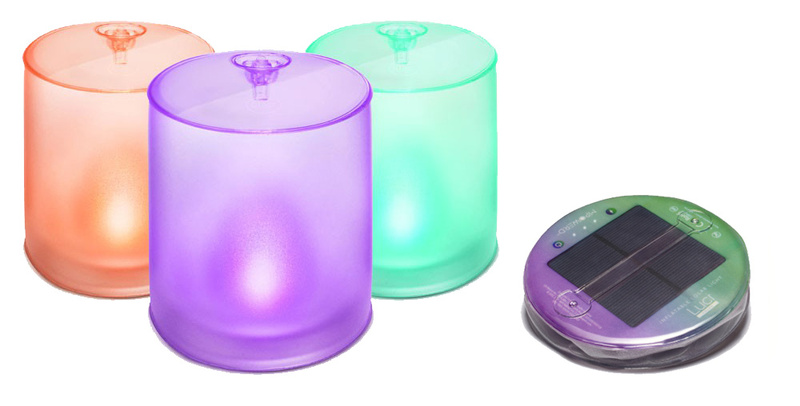 The Luci comes in various colors and sizes and is great for children or as a nightlight. 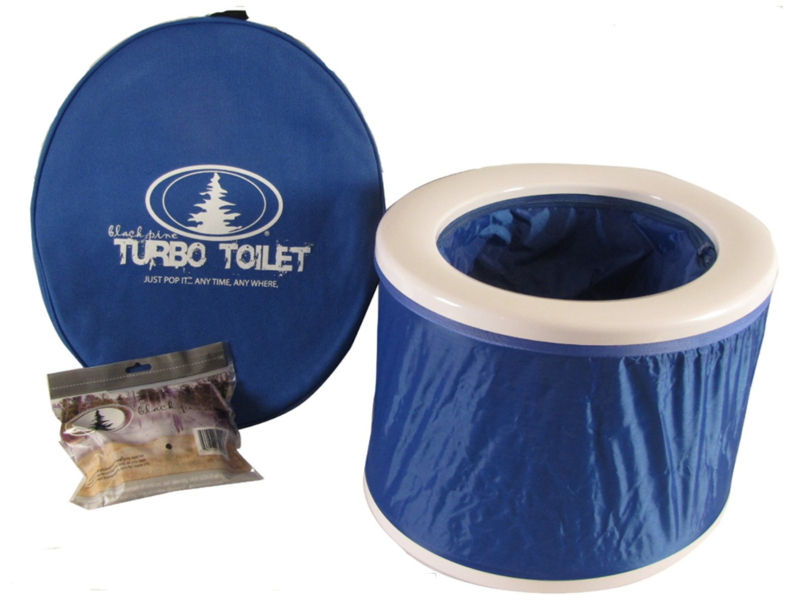 The colorful, portable Turbo Toilet is not only collapsible, it’s also lightweight. 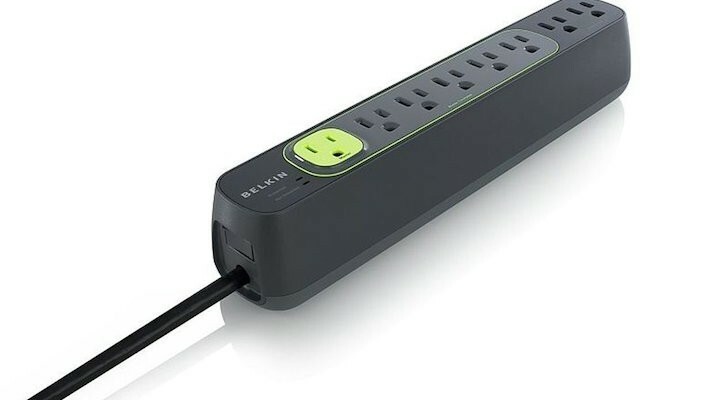 Coming in at only 4.3 lb., it only takes up about 2.5 inches of width space. It easily pops up for use inside or outside and comes with 12 replacement liner bags and odor control packets. It also comes in basic black. You never realize how useful buckets are until you don’t have one. 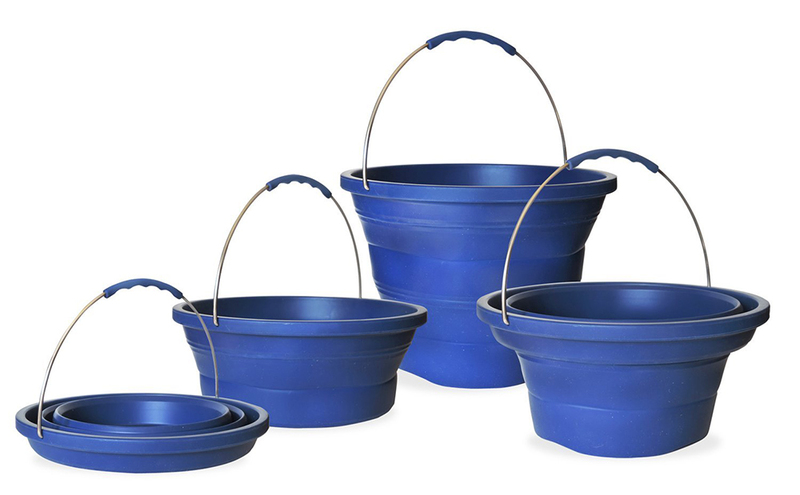 This collapsible silicone bucket from Infusion holds two gallons of water and can be adjusted to several heights. It can be used for hauling water, washing clothes or pets, or holding ice and cold drinks. The bucket and its handle collapse down to less than two inches. Wirelessly stream music from your phone or another mobile device and turn your RV into a tiny soundstage with this collapsible Bluetooth speaker. 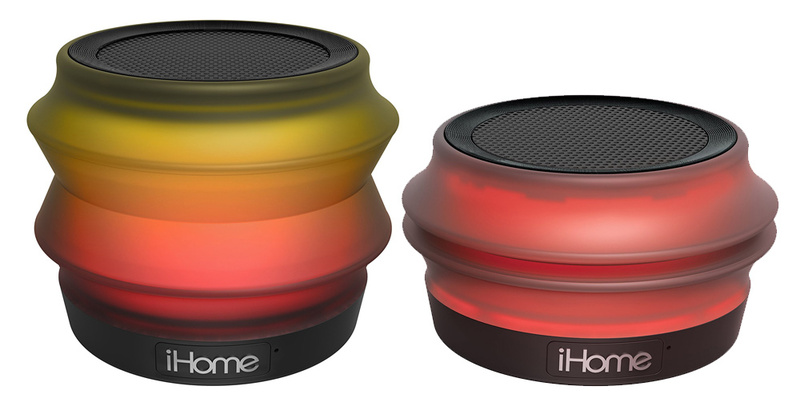 This speaker not only collapses down to the size of a hockey puck, but it also changes color to the music. The color modes can be adjusted for slow or fast music or just have fun with your favorite color. The speaker also comes with voice recognition and the battery lasts up to nine hours. 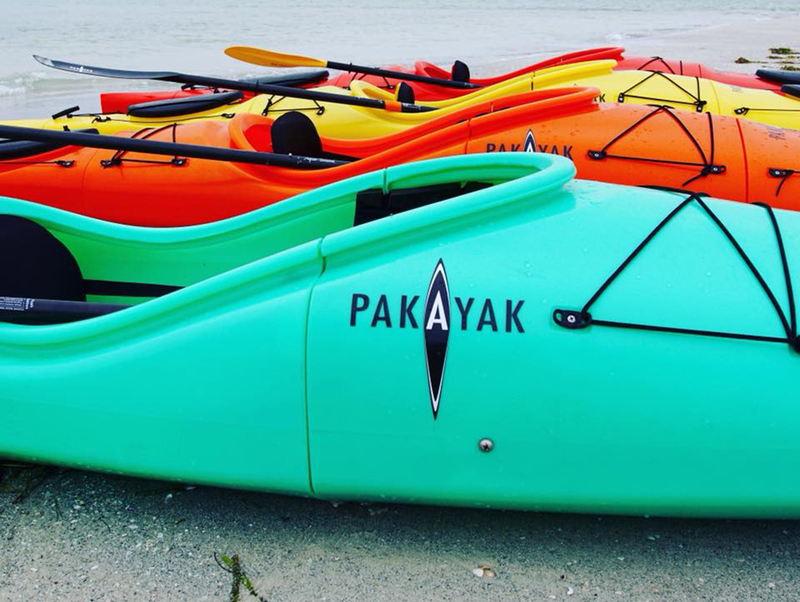 Kayaking and camping go hand in hand, so be one of the first owners of the brand-new Pakayak. After a successful Kickstarter campaign, the Pakayak Bluefin collapsible kayak will soon be shipped out to new owners. This unique kayak comes in six sections that pack inside one another. The separate pieces can easily be assembled in about five minutes by one person. Built in the U.S.A. with a specially formulated resin, the new kayak comes in four colors and is shipped with the paddle and rudder. I found a collapsible wagon at Costco that is very usefull. I cut a piece of Masonite that fits in the bottom, but is removable. 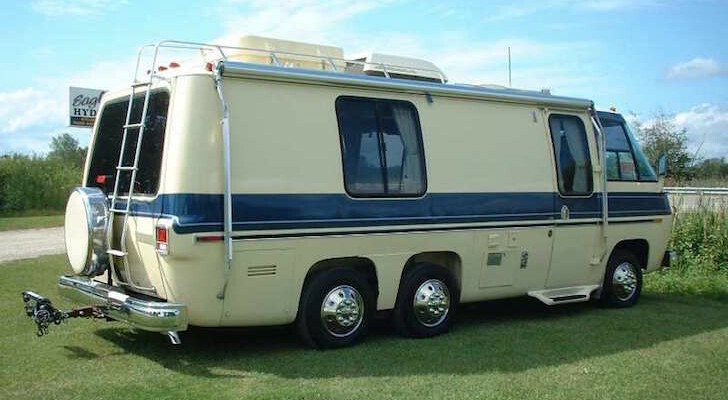 Great for hauling tools around the coach doing maintenance. Don’t think I want a collapsable toilet….